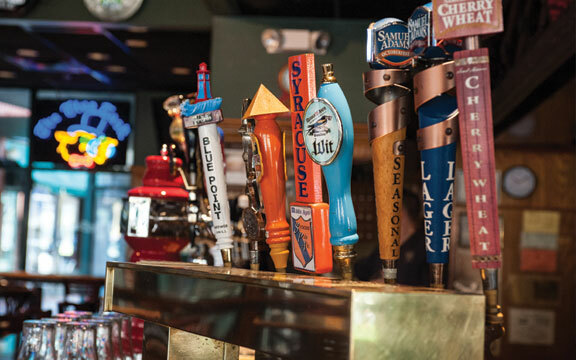 Think about Armory Square in downtown Syracuse: an area that picked itself up over 20 years ago and decided to “become” – become a go-to location for food, drinks, music, dance, and fun. The area never looked back, and has continued to serve up Syracuse staples – and surprises – for decades. One of The Armory’s anchor locations is The Blue Tusk. How to describe this restaurant? Parts of it are comfortably traditional, with its wood-and-stone, booths and comfort approach to décor. Another part is casual, open, boho experimental, with artistic flourishes – like finding the work of legendary local artist Elliott Matisse decorating the walls. And yet another is the order-at-the-bar, get buzzed with a pager when it’s ready convenience. And of course the main focus: great food and drinks. All of which is to say that The Tusk is a work in constant progress. Always busy, the Blue Tusk’s huge windows offer a kind of living art to people passing in the street, and the same to patrons inside the spacious restaurant. The Blue Tusk is a part of the fabric of Syracuse. But initially, co-owner and founder Tim Yorton simply had a small sandwich shop across the street, and it wasn’t until son Michael decided to actively join the family business in 1995 that the larger enterprise opened in its present location, with daughter Riann and Tim’s wife, Sandy, all part of the expanded organization. And since then, The Tusk has expanded another few times to accommodate a consistently growing clientele. 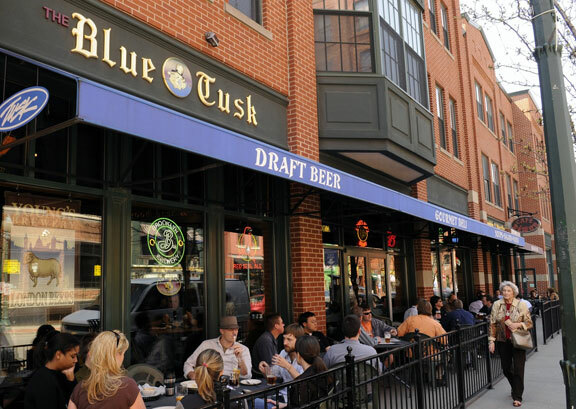 Today, in addition to its bar and restaurant, the Blue Tusk offers banquet facilities and summer-time outdoor dining, as well. 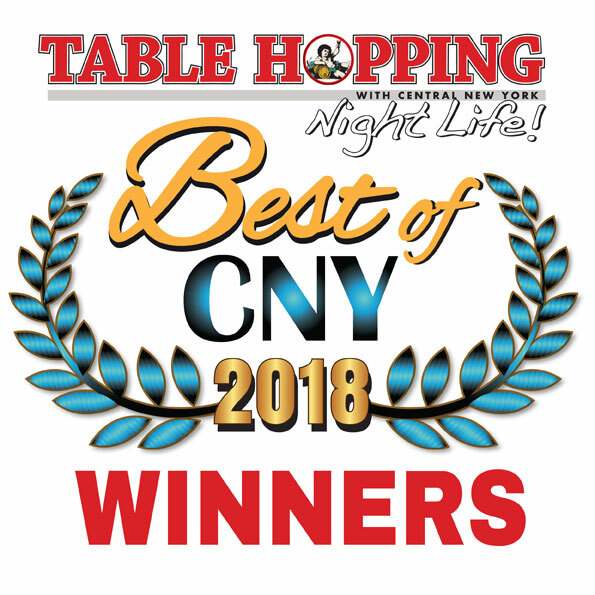 The Blue Tusk was voted the Best Place for Draft Beer in Table Hopping’s 2018 Best of CNY Readers Choice Awards. Sandwiches were definitely part of the growing business – and 3 beers on tap were added to the menu. In other words, pub fare – of the very best kind. But a true restaurateur is rarely satisfied with once-and-done, and not only stays interested in what his customers want, but is also interested in exploring the world of food and drink for new tastes and experiences to bring to them. Michael Yorton’s first major contribution to the family business was expanding the drinks offerings – adding wines and spirits to the bar to offer customers the wider variety of choices tastes demanded. 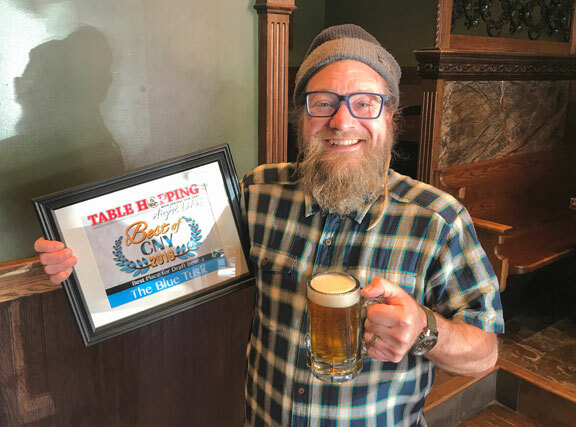 Once The Tusk offered 3 beers on tap and a large selection of specialty bottled beers. Now, it’s 69 taps – with just about anything you might want. Michael also began to explore, traveling to find new experiences in food and drink, and bringing them back home – and offering them with a Tusk flare. Diners will find a menu with offerings from around the world – cheeses, Mediterranean treats, hearty tacos, kim chee, sliders, specialty salads, and soups. The atmosphere may be cheeky and fun, the approach to the quality of the food is not.